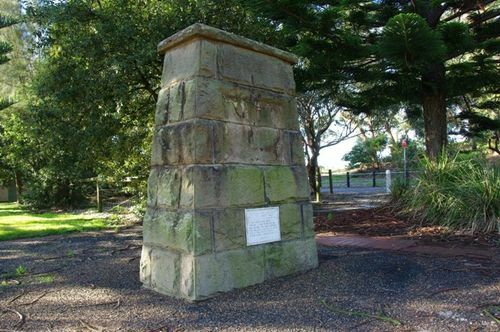 The monument commemorates the place where Captain Arthur Phillip first set foot on Australian soil. Captain Arthur Phillip Royal Navy was a British admiral and colonial administrator. Phillip was appointed Governor of New South Wales, the first European colony on the Australian continent, and was the founder of the site which is now the city of Sydney. In October 1786, Phillip was appointed captain of HMS Sirius and named Governor-designate of New South Wales, the proposed British penal colony on the east coast of Australia, by Lord Sydney, the Home Secretary. The First Fleet, of 11 ships, set sail on 13 May 1787. The leading ship, HMS Supply reached Botany Bay setting up camp on the Kurnell Peninsula, on 18 January 1788. Phillip soon decided that this site, chosen on the recommendation of Sir Joseph Banks, who had accompanied James Cook in 1770, was not suitable, since it had poor soil, no secure anchorage and no reliable water source. After some exploration Phillip decided to go on to Port Jackson, and on 26 January the marines and convicts were landed at Sydney Cove, which Phillip named after Lord Sydney. IN - THIS VICINITY, ABOUT 3 P.M. ON 18TH JANUARY 1788, GOVERNOR PHILLIP FIRST SET FOOT ON AUSTRALIAN SOIL. HE WAS SEEKING FRESH WATER. ON HIS APPROACH, A GROUP OF NATIVES, WHO HAD WATCHED HIM LAND, WITHDREW INTO THE BUSH. LIEUTENANT-GENERAL SIR JOHN NORTHCOTT K.C.M.G., K.C.V.O., C.B.